ChessWarehouse has a wide array of options for people to consider when shopping online. With so many options, it can be difficult to figure out the best overall fit. A good place to start is to look at the best selling options on their website. They might be best selling, but how exactly do they stack up? Here is a look at some of their best chess sets. With the name Magnus Carlsen connected to this set, it has to be a winner. This simple, affordable chess set is a perfect option for just about any type of player. Shipped in a travel tube with a should strap, the set can go on the road with ease to play chess anywhere. The set falls into the perfect price range, as it is a step up from some options, but it certainly will not break the bank. The set can be shown off as a display piece, but most people will store it in the travel tube when not in use. At ChessWarehouse, the set is constantly in and out of stock. If it is currently out of stock, make sure to contact the company and see if they have any updates. The only real con with this set is that the 20″ vinyl board could be a little bit better. It can only be so durable because it has to roll up, but it just seems to not be as high quality as the pieces. At first glance, the first chess set shares a lot of similarities with the Magnus Carlsen chess set. They are both pretty simple sets meant to be played every day, and they are shipped with travel tubes for easy transportation and storage. This set is a little bit cheaper though, and not a lot is sacrificed. This is a very simple chess set really meant for younger players or beginners. At the same time, even seasoned veteran have some type of set like this to play with. It definitely serves its purpose, and the spacious board does not make the game feel crammed at all. Compared to the one above, the color scheme really comes down to personal preference. The board is a different color, using green and white squares. The travel tube is also brown instead of black. For some people, the changes in colors will make a difference. The 10″ Folding Wood Magnetic Travel Chess Set might be relatively inexpensive, but it is a bestseller because it comes with quality craftsmanship and materials. 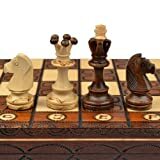 This is an excellent option for people who not only travel, but want to step up their game a little bit and get more than just an entry level chess set. Made of Sheesham wood, the board comes with a beautiful finish overall. All the pieces in the chess set are also made of wood, and they have great weight to them. The magnets work well, making it easy to play in a moving vehicle without any struggle. Overall, the set is a beautiful package. The materials used feels a lot more premium than what the price point would suggest. It’s a set that any traveler definitely needs to consider. The sizing of the set might make a few people look elsewhere. It is only 10″ x 10″, and the king height is 1″. This is meant to be a travel set, and a lot of people will probably get frustrated with the size if playing at home a lot with this set. The Battle of Waterloo Chess Set is the best selling option for ChessWarehouse when it comes to themed sets. Many people who are really into chess will look for themed sets to use and to display when not in use. Right away, any person can tell that a lot of detail went into this set. By far the biggest eye catcher with this set are the pieces. Bonaparte and Wellington take their sides, and they are flanked by Josephine and Catherine, respectively. This is a classic battle between the French dressed in navy and the British dressed in red. The details are very accurate, making this a truly historical piece. Each piece is hand painted, and it is very noticeable that this is where a lot of effort was put into. Even the pawns have details on them that many other chess sets simply gloss over. It might look good, but no chess set is going to be worth the money if it can’t handle a decent amount of play. The board is a very durable walnut and maple wood, and it is 15.75″ x 15.75″. The pieces have a good amount of weight to them as well, making it easy to move around and durable enough to handle playing on a consistent basis. Any person who is a chess player and a history buff should definitely consider adding this to their collection. It is one of the best themed sets out there, and an instant conversation starter. It might sound weird to call beautiful hand painted pieces a con, but because of the paint, heavy usage should probably be avoided in order to keep it looking great. This is more of a set that is designed to be used on special occasions. Otherwise, think of it more as a collector’s item and a complement to the home’s decor. Anything made of carbon fiber is almost always going to be high quality. Not only will the quality be there, but carbon fiber brings durability and a modern look. This chess set at its core might look relatively simple, but the more it is examined, the more it really shows off. This set really seems to fit bet in a home or office with modern decor. It not only shows that a person loves the game of chess, but that they take it seriously. The colors are bold, the storage options are of the highest quality and it really seems to be that perfect size (13″ x 13″). The veneer finish really tops off this set, which weighs in at over 10 pounds. While that might seem a little heavy to some, this is a set that shouldn’t be moved around too much. It’s intended to be a statement piece for chess players. It’s really, really difficult to find anything to complain about with this set. The only reason to complain might just be the price, but the materials justify it. There are very few sets made of these materials that are under $200 out there. It’s definitely not designed to be a starter set, but someone who just wants a quality option for display and play. Even though it has a modern look, the colors make it a good fit in just about any household. There are just very few that have this level of versatility as a display and playable set. Mixing brass art deco pieces with a wooden cherry stained chess looks absolutely beautiful, so it is no surprise so many people continue to purchase the set. The pieces are all very elegant and sturdy, making it easy to move around. The board is perfectly sized, and the storage underneath makes it easy to keep everything organized. One of the nice touches to this board is that the squares are slightly sunken. This helps a little bit with pieces tipping over or falling. While the pieces are pretty durable, dropping one to the ground could scratch them up. Sizing is 15.5″ by 15.5″, so it never feels as though the game doesn’t have enough space to operate. The pieces look slimmer than they actually are, as the king stands at around 4″ total. This set also comes with the same pieces, but a red decoupage board. It is slightly more affordable at $203.00, and has a slightly more modern look. That set can be found at https://chesswarehouse.com/collections/best-sellers/products/brass-art-deco-on-red-decoupage-brd?variant=38994693070. Some people might not be a fan of the elevated playing surface. It isn’t a game breaker by any means, but it does sit higher than a lot of other boards out there. Another option for history buffs, the Civl War chess set has great overall detail on every single piece in the set. Coupled with a great looking wood chest, and this might just be the best civl war themed chess set on the market. Organization is really easy with this set, as there is storage underneath the board. The storage chest has an antique style metal clasp that calls back a bit to the days of the Civil War. Like all pieces with a lot of details and unique shapes, storage and travel should be done with care. The storage chest comes with enough soft cushioning to protect them. As just mentioned, these pieces look great, but paint chipping and even piece breaking can happen somewhat easily. They are made of resin, but even the most durable materials out there can show some signs of vulnerability once in a while. Keep the pieces away from children and pets if at all possible. On most occasions, the set should stay home. Traveling with this set too often could be lead to a piece getting messed up a little. 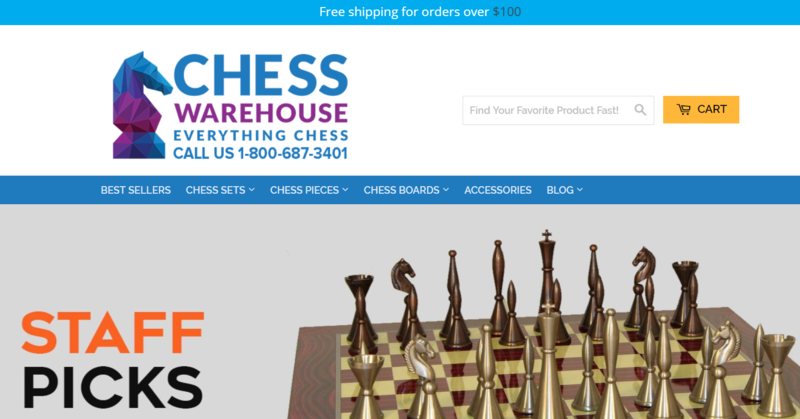 ChessWarehouse might still be relatively new, but it has really taken off as one of the top websites in the industry for chess sets. Founded in 2014, the Southern California company offers sets, pieces and accessories for those who are most passionate about the game of chance. They are known for offering some of the best prices out there, and that is why they continue to rise of the rankings in the chess world. One of the things that the company really takes pride in is customer service. A lot of companies out there might be in a particular field, but they do not have a lot of passion about it. This isn’t about making money only and trying to grow as a business. Everyone who works with ChessWarehouse is extremely passionate about the game, and anyone talking to a customer service representative will understand that right away. Some people shop at ChessWarehouse already knowing exactly what they want to purchase. For others, they’re looking for advice based on what they want and their needs. The customer service provided by ChessWarehouse, free of charge, can help with that during business hours over the phone (or through email). Shoppers will find pretty competitive prices across the board, as they match up well with many of the other big companies out there. They also do a pretty good job of constantly adding new sets for people to enjoy. Free shipping in United States is available if a person spends $100 or more. Customers have protection when it comes to shopping online. If a person is not completely satisfied with their purchase, they can make a hassle free return or exchange. They also continually update prices to stay competitive with all other major chess companies out there. With just five years in the business, ChessWarehouse might just be getting started. Look for them to continue to grow and provide quality shopping options for all chess players. They certainly seem to be growing at a pretty consistent rate thus far.